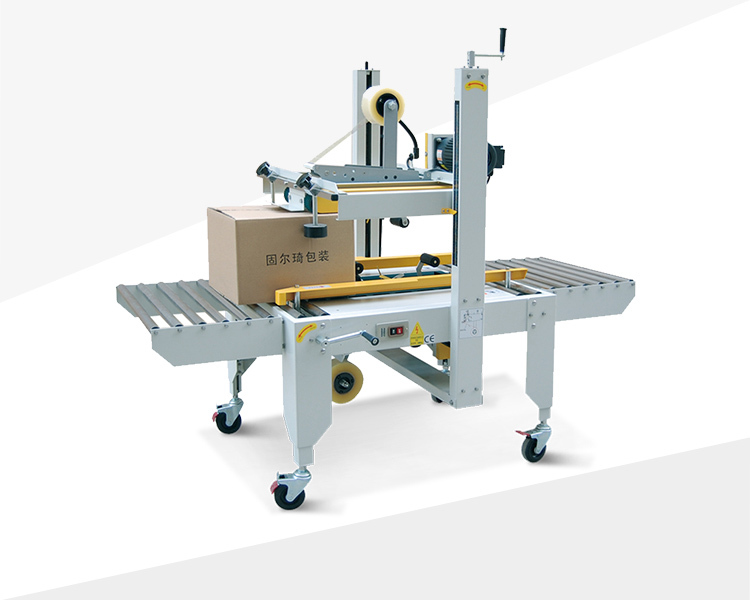 Semi automatic carton sealer GPB-56 use four belts to complete the upper and lower drive sealing box, ensuring the sealing box is smooth and fast, and is used in lighter and narrower cartons. Use four belts to complete the upper and lower drive sealing box, ensuring the sealing box is smooth and fast, and is used in lighter and narrower cartons. Top driven adopts 5 stars handle knob + folding plates smooth + box position wheel, lockbox position wheel and keep folding plates smooth with 5 stars handle knob, preventing carton from lifting and making the sealing beautiful. Equipped with 2 Omron Motors, fast speed, low cost, sealing smoothly and stably, continuous uninterrupted operation. Manually adjust height and width according to carton size within only 1 minute.